Somewhere around the end of my junior year in college, a buddy and I decided to take a camping trip. Living in the Southeast at the time, we decided to spend about a week in the Great Smokey Mountains — a decision that proved to be an excellent choice. What proved not to be such a wise decision was my abdicating the food choices to my friend. He’d been camping before and I had never planned a camping trip myself. We weren’t doing any serious backpacking, just campsites where we would have access to the car trunk and a cooler, so I was thinking that we would be having some grilled meat most evenings. I was wrong. Perhaps my friend had less camping experience than I thought or perhaps he was trying to be sensitive to our college-student budgets. But the first night he pulled out sandwich bread. Not my choice, but I’ve eaten sandwiches and survived, so that couldn’t be too bad. Then he pulled out the topping: cans (lots of cans!) of potted meat. 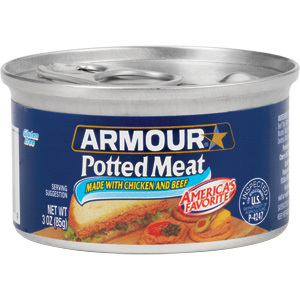 “Potted meat!? What’s that?” Bad question. I read the ingredient list: Mechanically Separated Chicken (you really don’t want to know, but if you must…), Beef Tripe, Partially Defatted Cooked Beef Fatty Tissue, Beef Hearts, Water, Partially Defatted Cooked Pork Fatty Tissue, Salt. And on top of that, he wanted to put grape jelly. That was not good eats. So the next day, we came down from the mountain and went grocery shopping. The problem was that we had not prepared ourselves for the outing. We knew we’d need to eat, but we weren’t realistic about those needs. When we struggle with temptation, we are in a similar position as my friend and I on that camping trip — we have not made adequate preparation for the battle. Maybe we haven’t even recognized that we are in a battle — and we are caught unawares by clandestine attacks. Or perhaps we know that we are in a battle, but we underestimate the opponent, so we presume that we can thrive on spiritual tripe. But we can’t. Notice two things from this passage (Eph. 4:14-17): The ability to stand firm is preceded by the preparation of putting on the armor provided by God. If we will stand firm, we must first prepare to stand by girding our loins with the truth, put on the breastplate of righteousness, put on the shoes of the gospel, and so on. We prepare for the battle by living truthfully, righteously, gospel-centered, in faithful trust of God, loving our salvation, and wielding the truth of God’s Word. And then we stand. Secondly, what is said of the gospel could be said of all these truths — when the gospel is put on by the believer, then he is said by Paul to be prepared. He lives in light of the gospel, preaches the gospel to himself each day, communicates the gospel, and is thus prepared to withstand attacks by the evil one on his life. Now he can stand. The question for us then is quite simple — are we preparing ourselves for the tests against our spiritual life? Are we being intentional in our actions so that we can walk with the Lord and against temptation? Or are we lackadaisical, assuming that a little spiritual potted meat will be enough to see us through the temptations and pressures of life?